Paper Textures give you the option for brushes to interact with the canvas. Click the Paper button to display the Select Paper dialog. 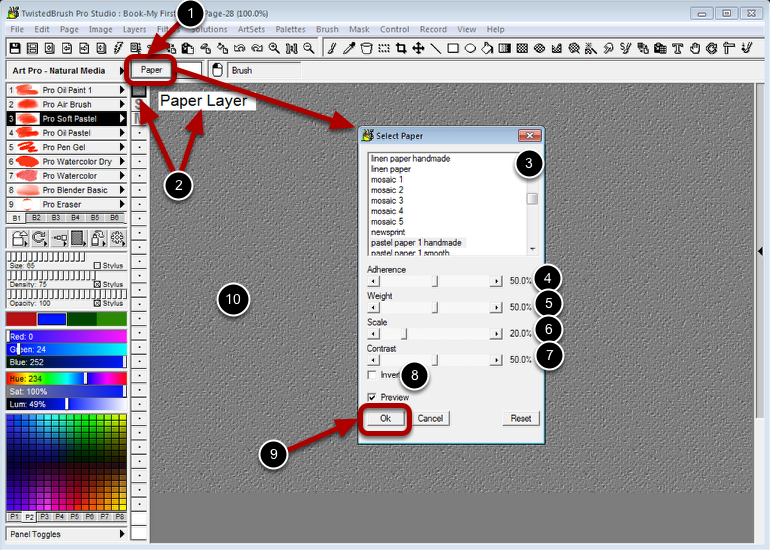 Notice that the Paper Layer is selected when the Select Paper dialog displays. Numerous paper / canvas / support types can be selected here. The Adherence slider controls how easily the paint sticks to the paper. Normally you will not be adjusting this. The Weight slider controls strength of the texture. The Scale slider controls the size of the texture. The Contrast slider is similar to Weight but adjusts the texture to have greater separation. The Invert option will invert the texture. The Ok button is clicked when the selection and settings are complete. The paper is represent on the page in grayscale. This is grayscale color is only shown for purposes of adjusting the settings. Once complete with the setting the paper and texture will be invisible until painted over.